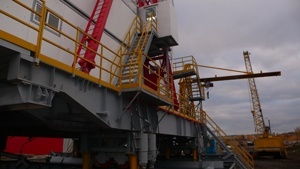 Drilling rig БК-200Э with load capacity of 200 tonnes designed for cluster drilling wells for oil and gas from conventional drilling to 3200m depth. - thermal regime - 45°С+40°С. - split-level rig’s train only 45 metres long. Pumps УНБ-600А, УНБТ-950, spare parts. Swivels УВ-250, УВ-320, spare parts. Spare parts of pneumatic control. 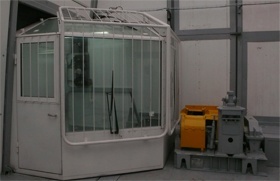 Rotor Р-700, ready-assembled and spare parts. 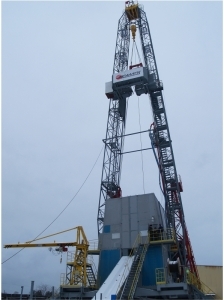 Crown blocks and hook block for drilling rigs ЗД-76, 4Э, 3000ЭУК. Draw works ЛБУ-1200, ЛБУ-1200К, and spare parts: all types of brake disks and line shafts. Equipment is manufactured in TMZ ltd. using advanced technology and international standards of quality control. In 2008, was put into operation workshop № 5, designed to produce 2000 tons of welded constructions a year.